Religious hostility has increased in Australia, bucking the global trend of decreasing government restrictions and social hostility involving religion. A new study released by US-fact tank Pew Research Centre shows that Australia is one of only 13 nations to have experienced an increase in the rate of social hostility involving religion between 2013-2014. Social hostility is measured by recording “acts of religious hostility by private individuals, organisations or groups in society. This includes religion-related armed conflict or terrorism, mob or sectarian violence, harassment over attire for religious reasons or other religion-related intimidation or abuse,” says Pew. 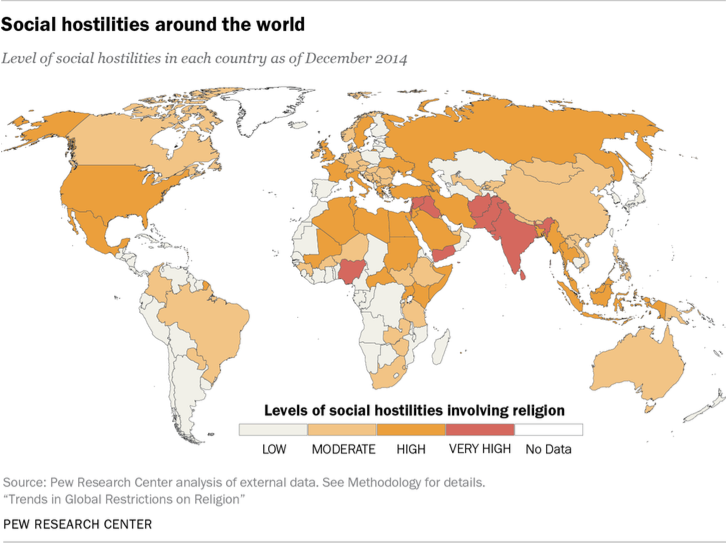 Other countries with an increase of social hostility are Yemen, Lebanon, Malaysia, United States, Jordan, Ukraine, Azerbaijan, Djibouti, South Africa, Burundi, Canada and Mongolia. The countries with the highest score in the “social hostilities involving religion” index were Israel, Iraq, Syria, Yemen and Pakistan (all in the “very high” category). France, United States and United Kingdom all rated higher (and sit in the “high category”) in the social hostility stakes than Australia, which now sits between South Sudan and Columbia in its scoring of “moderate”. Across the world, government restrictions and social hostility involving religion are on the decline, despite a marked increase in the number of countries that experienced religion-related terrorist activities.